Energy storage has been a hot topic of late. While the focus has been on the new Tesla storage batteries and their ability to further enhance on-site renewable generation (think solar PV), there has been some discussion of thermal energy storage and the benefits it can offer. Each has their role to play and it will be the combination of on-site renewable generation (once again think solar PV), energy storage and efficient use of energy for high energy applications such as heating, cooling and hot water, where we really optimise our energy usage, or to use a more appropriate term – enhance our energy productivity. Geoexchange is a simple use of thermal energy that is (mostly) stored in the ground. (The term ‘mostly‘ is used because those who know our work are aware that we use all sorts of forms of thermal energy). The ground absorbs and stores the heat from the sun and we simply use it to our advantage as a heat source (heating), a heat sink (cooling) or for thermal storage. In preparing a recent presentation for the Energy Storage Conference that was almost immediately after the Tesla announcement, we developed the below graph to show how geoexchange uses the ground (in this instance) as thermal storage. The building in question is the Riverina Highlands Building in Tumut NSW and it uses a vertical borehole Ground Heat Exchanger (GHX). The red line shows the buildings heating requirements or heat extraction from the ground, which for an Australian application has peak heating through the middle of the year. As would be expected, this buildings cooling requirement or heat rejection to the ground (blue) is peaking through the summer. This is a fairly typical heat load profile for an office building in much of Australia. The interesting element from a thermal storage perspective is how this graph enables us to show thermal storage over different time frames. 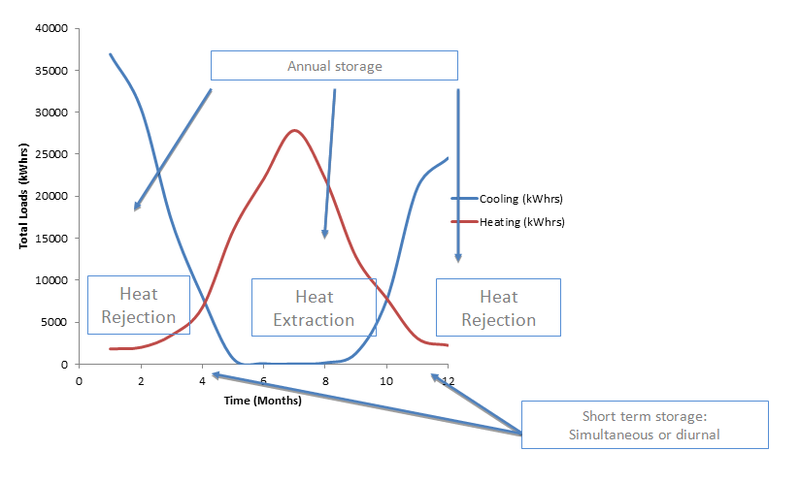 For the purposes of simplicity, we have identified the periods of thermal storage as either short term (simultaneous or diurnal) and annual storage. The short term storage is where the building has a mix of both heating and cooling. This occurs for a variety of reasons. Simultaneous heating / cooling is where one zone of the building is in heating mode and another in cooling mode. An example of this is when morning sun warms the eastern side of the building and it requires cooling, while the western side is in heating mode while it waits for the sun to reach it. An example of a diurnal (daily) cycle is when the building is in full heating mode in the morning but then requires cooling as the day warms up. The heating system could then be back on again in the evening for after work meetings or functions when temperatures dip back into single figures (Celsius). In each of these instances, the geoexchange system is using the ground for short term storage, extracting or rejecting heat from the ground heat exchanger as required by the occupants. Annual storage is the bigger picture where we look at the overall heating and cooling requirements through the seasons or over the annual cycle. Simply, the building will reject heat into the ground in summer and then extract it back out in winter. In each instance, the role of the Ground Heat Exchanger is that of a dynamic thermal battery giving and receiving heat as the building occupants require. As the above shows, energy storage is not just limited to electricity storage and as we say – thermal is energy too! To find out how thermal storage could assist with your own project, please feel free to contact us.